The purpose of this venture is to capitalise on the many linked agencies and platforms of creative arts in and around Wicklow/Dublin, with a special emphasis on dance and film. 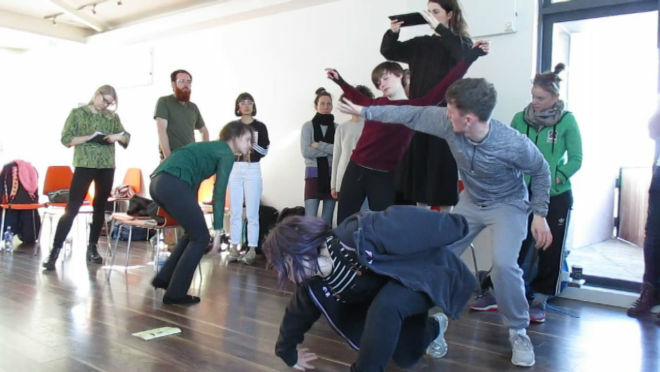 Wicklow Screendance Laboratory 2018 is a 4-day-long symposium that will draw choreographers, dancers and film makers together to create an exploratory experience within dance-and-film, in county Wicklow. The event will be led by Dr Adrienne Brown, with invited guest artists Marisa M Hayes and Franck Boulègue of Video Screen Dance, (Bourgogne, France) and Jasmine Morand director of Prototype Status (Switzerland). Adrienne Brown’s 30-year span of choreographic work is housed in the National Dance Archive, University of Limerick and she is a former Chair of Dance Ireland (2008 – 2013). She holds a PhD from the School of Music, University College Dublin (2012). Interdisciplinary cross-fertilisation between art form practitioners such as literature/film/sound/music/dance etc. Films selected for screening will be shown at a cinema screening event at Mermaid Arts Centre. Submissions must include a link to Vimeo / YouTube footage, supplying passwords where appropriate. * Note – There is no honorarium for works submitted. Artists / Film-makers submitting films MUST ENSURE AND CONFIRM permission AND all rights are retained for a public showing of the films during the symposium. Dance pieces selected for showing will be presented at at Mermaid Arts Centre and Bray Bowl Dance studio. A short sample of the work should be sent via Vimeo / YouTube footage, supplying passwords where appropriate. * Note – There is no honorarium for works submitted. Artists / Film-makers submitting films MUST ENSURE AND CONFIRM permission AND all rights are retained for a public showing during the symposium. Please supply Name, email address, a short Biography and your reasons for applying to the Laboratory (see application form). There is no honorarium for works submitted, or attendance at the Laboratory. Wicklow Screendance Laboratory retains the rights to public showing of films during the symposium. This initiative has been funded through the Arts Council Festival Fund, Wicklow County Council Festival Awards and is also supported by Mermaid County Wicklow Arts Centre.